During the opening ceremony. 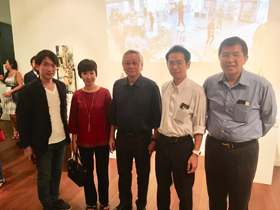 The opening ceremony of Toyama Art and Glass Exhibition in Singapore ~ The Spirit of TOYAMA Glass ~ was held at JCC (Japan Creative Centre) on Friday, 18 January 2018. 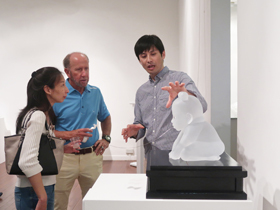 This exhibition features unique creations by seven chosen artists as well as four painters and sculpturists, all of whom are connected to Toyama City in one way or another, be it their birthplace, or related to their study or work experience. This is also part of a project to promote such talented artists beyond Japan and overseas. The opening started off with a welcome speech by our JCC Director Ms Akiko Sugita, who expressed her delight in bringing this show for the very first time here in Singapore. Following this, T.A.G. Director Mr Koshi Kugo introduced about the origins and development of the glass industry in Toyama City. Mr Joseph Runzo-Inada, Chief Resilience Officer of Toyama City, also spoke more about the charms of Toyama City. 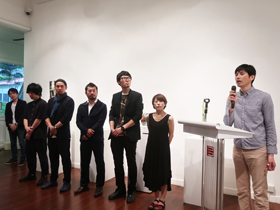 The curator of the exhibition, Mr Hiroyuki Haoka, as well as six artists were also present at the opening, expressed their appreciation to all the guests. 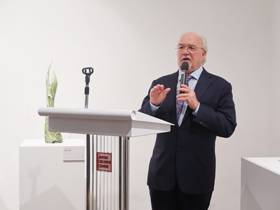 During the reception, many guests approached the six artists to ask in detail about their artworks and inspiration. The exhibition was running at JCC from 18 – 23 January 2019, and extended it till 25 January 2019 due to overwhelming response. 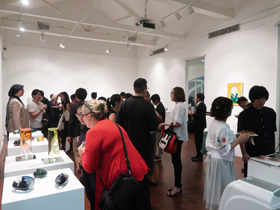 Other works by the artists were also on display at Mizuma Gallery Singapore from 12 – 31 January 2019. 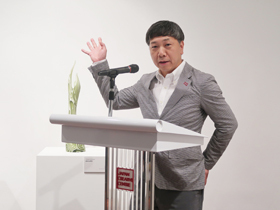 One of the artists, Mr Koichi Matsufuji, speaking on behalf of the artists, together with the curator of the exhibition, Mr Hiroyuki Haoka. 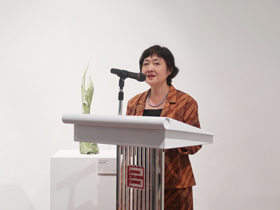 JCC Director Ms Akiko Sugita. T.A.G. Director Mr Koshi Kugo. Mr Joseph Runzo-Inada, Chief Resilience Officer of Toyama City. One of the artists, Mr Koichi Matsufuji. One of the VIP guests, Mr Frank Goon (CEO and Managing Director of Berinda Properties), together with Mr Gaku Mizota (JCC Deputy Director) and Mr Hiroyuki Haoka (exhibition curator). 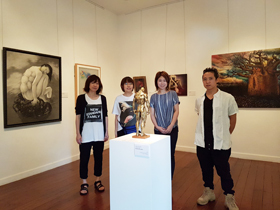 The four painters and sculpturists: Ms Chikako Hirai, Ms Yurie Kawagoe, Ms Emi Makida, Mr Hokuto Kiyokawa.